Earth and the moon are mere dots in this photo captured on Jan. 17, 2018, from a distance of 39.5 million miles (63.6 million kilometers) by NASA's OSIRIS-REx asteroid-sampling spacecraft. Here's a new perspective on your home planet, helpfully provided by a NASA asteroid-sampling probe. 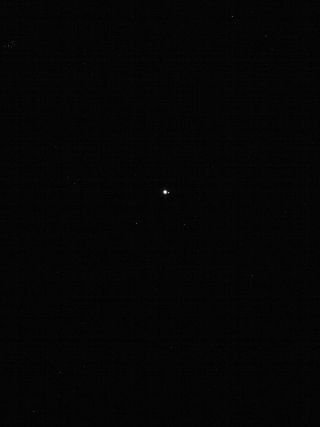 Earth and the moon are two bright dots floating in an immense black void in the new view, which was captured by the space agency's OSIRIS-REx spacecraft on Jan. 17 from a distance of 39.5 million miles (63.6 million kilometers). "Several constellations are also visible in the surrounding space," NASA officials wrote in a description of the image, which was released today (Feb. 14). "The bright cluster of stars in the upper left corner is the Pleiades in the Taurus constellation. Hamal, the brightest star in Aries, is located in the upper right corner of the image. The Earth-moon system is centered in the middle of five stars comprising the head of Cetus the Whale." OSIRIS-REx was streaking away from Earth at about 19,000 mph (30,600 km/h) when it took the photo with its navigation camera, as part of an engineering test, agency officials added. The $800 million OSIRIS-REx mission launched in September 2016, tasked with snagging samples from the big, potentially hazardous near-Earth asteroid Bennu and returning them to Earth. The spacecraft's path to Bennu has been circuitous. OSIRIS-REx performed a speed-boosting, trajectory-refining flyby of Earth this past September, and it's scheduled to rendezvous with the space rock this summer. The probe will study Bennu from orbit for a while, then spiral down and pluck a sample in July 2020. If all goes according to plan, this sample will come back to Earth in September 2023, enclosed in a canister that floats to a parachute-aided touchdown in the Utah desert. Mission scientists hope OSIRIS-REx teaches them more about the role that dark, primitive, carbon-rich asteroids such as Bennu may have played in seeding Earth with the building blocks of life long ago. The probe's observations should also prove useful to future asteroid miners, as well as folks studying the best ways to nudge potentially dangerous space rocks away from Earth, NASA officials have said. This wide range of science objectives is spelled out in the mission's full name, which is quite a mouthful: Origins, Spectral Interpretation, Resource Identification, Security, Regolith Explorer.